his is a 5-day detox program that will primarily consist of juices, smoothies, and plants. However, the main focus of this program is NOT to rapidly lose weight and get “fit”. We will work in unison with God to help heal our bodies from the inside out. So often we pray for a weight, fitness, or health miracle, when God has ALREADY given us what we need for healing in the vegetation He created in Genesis 1! Three years ago when I moved to Michigan and experience my first (what felt like 6-month) winter, I found myself crying almost daily for WEEKS towards the end winter. I didn’t understand what was going on. I kept having these internal conversations with myself asking if this is what depression felt like and if I was suffering from it. 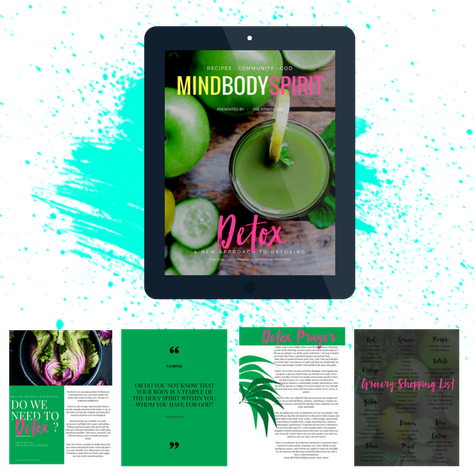 This detox will be an unusual 5-day journey as it will challenge you to focus on God (NOT losing weight), receiving clarity on YOUR mindset to achieve optimal health, and getting rid of emotional and spiritual junk that has weighed you down and stunted your growth! So you will not only be getting your health in good shape, God will also visit you and give you instructions about other areas of your life that you have been seeking clarity and guidance. *KEEP IN MIND THAT YOU WILL NEED TO BUDGET ADDITIONAL FUNDS FOR GROCERIES. After you sign up you will receive a confirmation email.